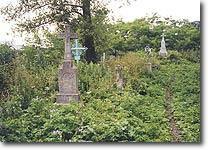 The original Catholic cemetery is located to the west of the town centre, just behind the modern Ukrainian Orthodox church, bordered to the north by what is now Koliyova Str. 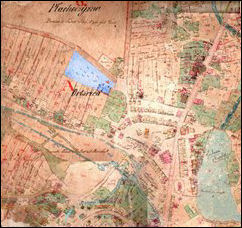 About 1.6 hectares (4 acres) in area, the cemetery�s distinctive shape appears on a map of Tluste from 1858 (area of light blue), and it is clearly marked on subsequent maps of the town. 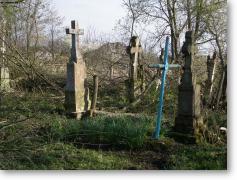 Presumably burials took place there for well over one hundred years, until it was closed in the 1960s and replaced by the new cemetery on the other side of town, on the road leading to Lisivtsi. The cemetery is accessed through a gate near the church and a central pathway that runs on a more or less east-west axis. One finds the old tombstones of both Roman Catholics and Greek Catholics alike, since the cemetery served both the Polish and Ukrainian communities. There is no known index of the graves in the cemetery. While some of the inscriptions can still be made out, with familiar names from the past, many of the grave stones have deteriorated beyond recognition. 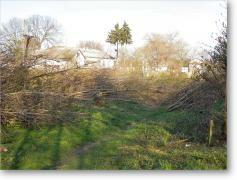 The cemetery is very badly overgrown with brush and small trees, and it is encroached upon by the adjacent plots of land to the immediate south. Goats can often be seen grazing amongst the thick shrubbery. Nevertheless, some of the graves have fresh flowers, indicating that some visitation still occurs. 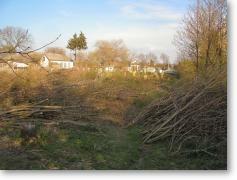 In Spring 2008, a major cleaning operation was undertaken -- presumably by the municipal authorities -- to try to clear away some of the brush and young trees. 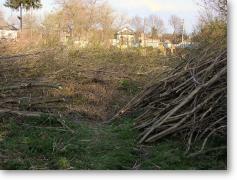 This exercise, illustrated in the photos below, should improve access to at least some of the graves.